Back in early March I wrote a post called Operation: BLISSFULLY HAPPY that detailed my plans over the next 1, 2 and 10 years. I’ve also been updating and tackling my to-do list for my entire home as I go here with the weather causing changes and adjustments. 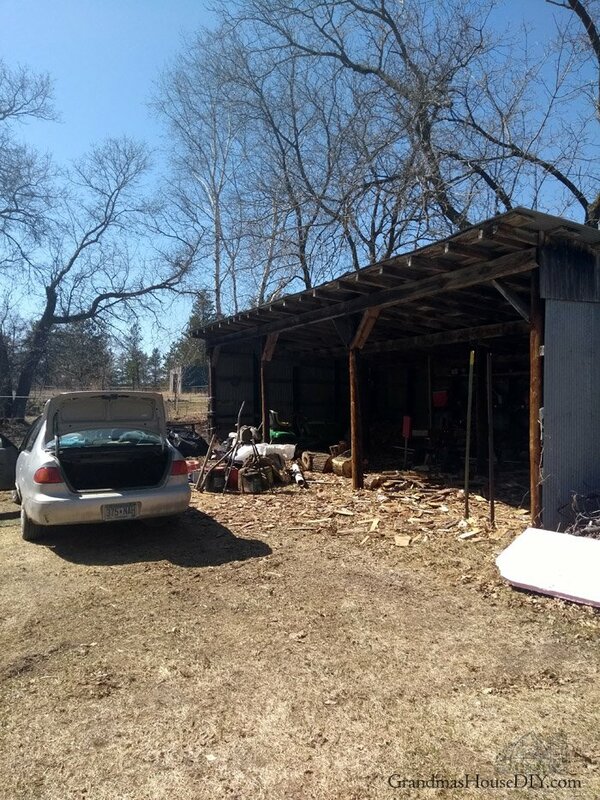 When spring FINALLY arrived I hit the ground running and put myself to work starting with my wood shed! This shed started off as my grandpa’s machine shed where he kept his tractors etc. It remained his machine shed for DECADES. From there it was taken over by my folks’ golf course and housed mowers for years upon years. 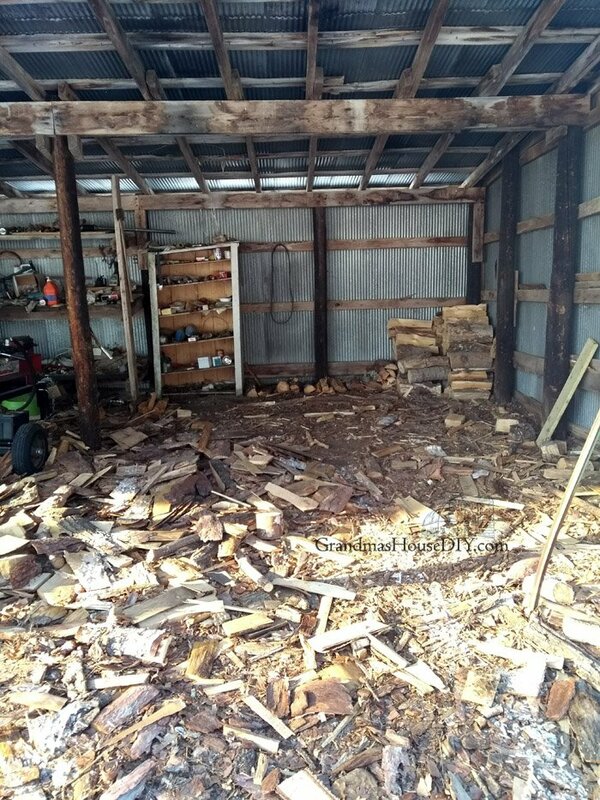 From there it became my wood shed as I used to heat entirely with wood. So, as you can imagine (after nearly 80 years!) 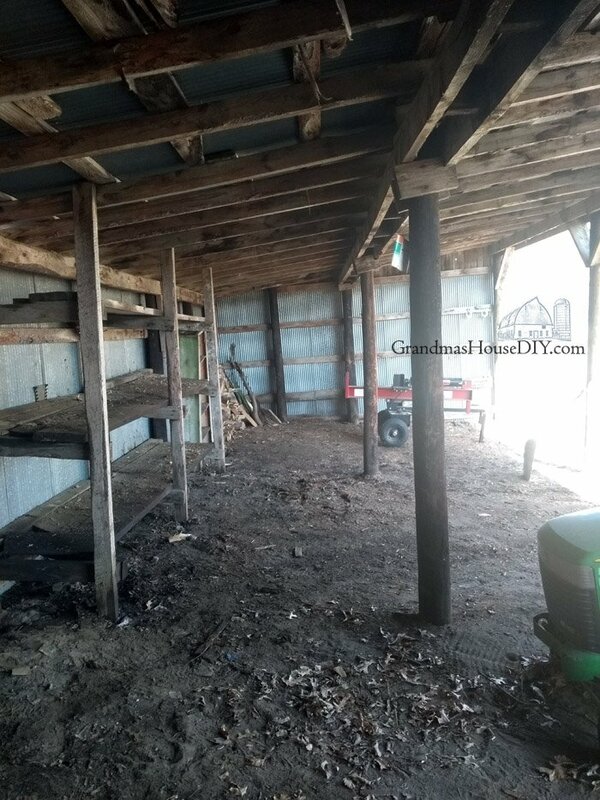 this old shed desperately needed to be cleaned out! My grandpa kept everything he owned neat, tidy and safe, but he also KEPT everything. My father, on the other hand, was organizationally challenged to the point of it almost being hard to believe. My ex was somewhere between them but I’m convinced that he felt that throwing actual trash away was simply beneath him. SO, here I am, finally tackling a project that has been bothering me for at least ten years, even long before I owned this place. Now that I’m single I can finally sell, throw away, give away, burn and purge without another human being’s laziness keeping me from it. My mom has felt the exact same way about this shed for many years so, not an hour after I dove in, she was right there beside me. Honestly, half of the stuff on those back shelves I didn’t even KNOW WHAT IT WAS. Ancient tools, parts, pieces off of hydraulics from golf course mowers, a lifetime supply of used air filters, endless, ancient, gas cans and oil cans filled with god-knows-what. And, in the mix of all of this, was trash from both my ex and from my dad and four empty skoll cans that MIGHT have been antiques! Fortunately, I have some friends that have a MAJOR affinity for old tools and machine parts so nothing went to waste (or to the dump) that was not actually trash. They stared with their own WTH looks at the total randomness of what I had going on. At one point, all three of them, standing there with stuff in their hands, were asking me, “Where did this come from! ?” Boys, I got no clue! 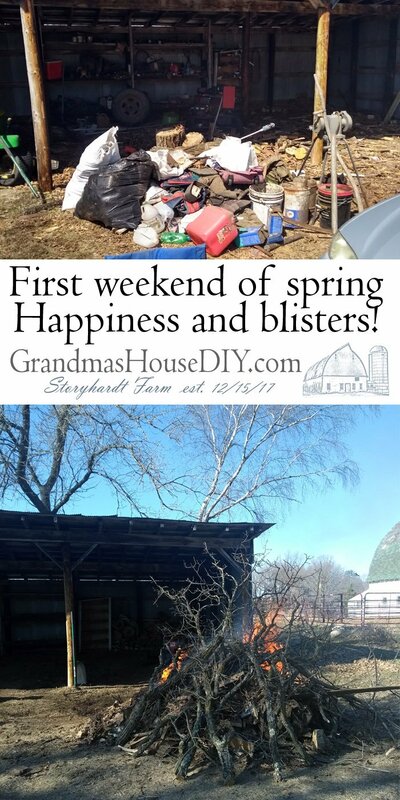 The biggest job was not the trash or the endless-whatever-stuff actually, it was the two feet of wood chips that covered nearly half of the shed and the literally three hours of shoveling because I just NEEDED it all cleaned out. FOR REAL: The ground floor of this shed hasn’t been seen in years! I wanted it down to the dirt for one very important reason that I have mentioned several times on the blog here. 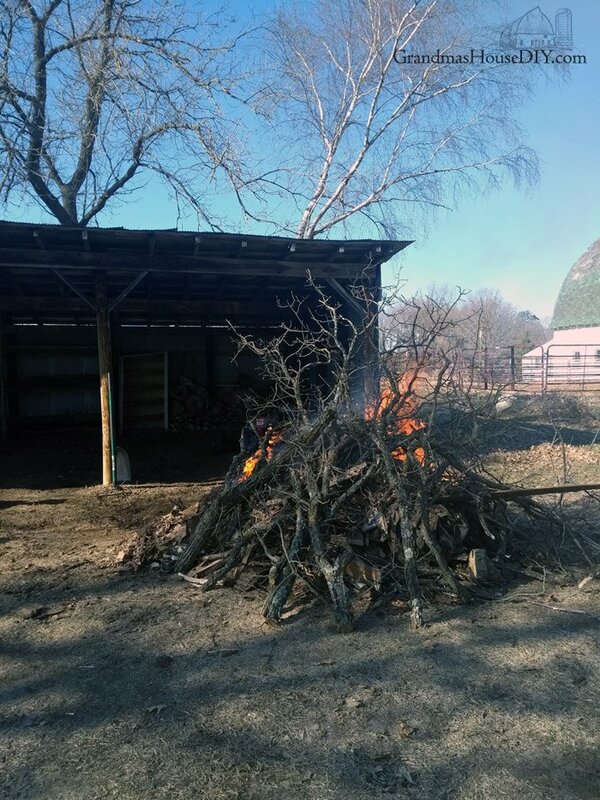 This wood shed is my horse’s future hay and grain shed so I wanted anything that was otherwise TOTALLY GONE. I was going to be moving my wood to my garage (that was the old plan) but this endless winter meant I had no wood to move and also, I’m so totally DONE with wood. And by DONE I mean – I’ve already sold the wood splitter you see in my photos here. Am I throwing a tantrum? YES I AM! And I am really looking forward to installing another form of heat for my home later this fall and never again compromising on something when my gut told me it was a bad idea. NEVER AGAIN! Moving on to the final reveal: A spectacular, empty shed that is so clean I have literally walked down here every day since I got this done to just stand in it. It makes my heart SO glad! The big shelves in the back I’ll be disassembling and reusing, the little old bead board cupboard sadly did not survive being moved. The pile of stone and lawn mower have both been sold along with the wood splitter which means I am a breath away from having my “new” car paid off which means I am MONTHS ahead of my I-hate-bills-and-playing-interest-timeline. And now we’re moving on to my sad truth: I SHOULD sell my Corolla because I am an actual adult and I do not need her 🙁 Seriously, this is terrible. I love my first car, my favorittessst car EVER. My Corolla! My obsessive ridiculous absolute MUST-get-rid-of-things-I-do-not-need actually may break my own damn heart! I HATE things that I have to dust or feed or move or that make my life harder or that I must take care of or pay for and that never helps me in my life in any way shape or form… well now I know suddenly exactly why I kicked my ex out. But it is also kinda wonderful because I am sore in the best way and my heart is glad as only working outside to improve your own home can do. I have a blister, bruises upon bruises and VERY tired feet but I can’t wait to move my horses down here! They’re gonna run around and buck and fart and trip because, despite what people would have you believe, they are actually totally lovable morons. Horses have like NO depth perception so their antics in new areas is so comical I’m gonna pull up a camping chair and open a beer for the show. 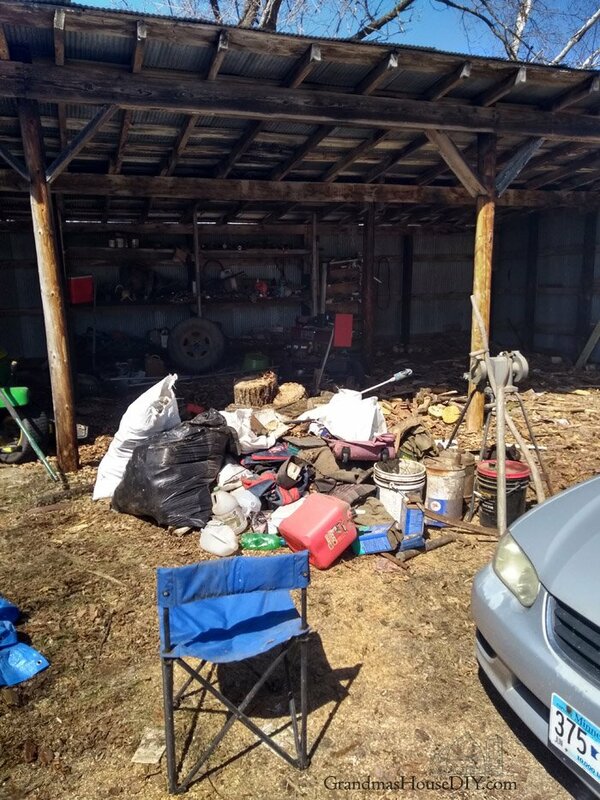 Since the big shed clean out I’ve hauled four loads to the dump and also totally cleaned out my garage of all the trash my ex left behind there too. A couple of hours of organization and it felt like I had a brand new garage – I totally twirled and danced because there was suddenly SO MUCH SPACE! Guys and gals, I am almost completely rid of every last bit of crap my ex left behind and have already moved on to fixing the projects he either completed incorrectly or never completed at all. I was told that realistically it would be YEARS before I got to this point. Have we discussed how stubborn and busy I am yet? Cause yeah I’m totally getting all this stuff done if it kills me cause I honestly just CAN’T WAIT!! Good on YOU Tarah. You did the work. It is YOUR home. YOU are the one making it work for YOU. Thank you Joy, it feels SO good! I am so relieved to be able to just be me again with my own home! LMAO…..”knew suddenly exactly why I kicked my ex out”. Oh, Girl…. Sometimes you just don’t realize what you been putting up with til you don’t have to, right? Oh that is such truth lol! That is great that you are getting rid of all the trash figuratively and literally! Nothing more soothing than lots of space!! Great work! And we’ve burned wood here for almost 25 years, so I know how much work it is. I would miss the quick, dry heat in winter, but I would NOT miss the dust and the mess and the huge amount of work! Thanks Michele, yeah it was a tough winter for me doing it alone. I think if we had had a more normal winter I wouldn’t be quite so crabby about it lol but that darned winter just wouldn’t end! Oooohh, doesn’t that just feel grand!?! So happy for you. Thank you! And, YES, it felt so wonderful and such a relief! Wow you go girl. Taking out the trash is freeing. Found you on Blogger’s Pit Stop. Thanks Candy for coming by! Congratulations on finally being able to tackle your projects just the way you want. Thank you for joining The Really Crafty Link Party this week too! I haven’t stopped by in a couple months ( things have been really crazy here) so I just realized you went through a divorce, I am so sorry although I know just how wonderful it feels to be free of the worries and the abuse ( whether it is mental or physical). Life just gets better now. Thanks for stopping by bloggers pit stop. Yeah I think if I didn’t have to do it alone again I would consider continuing to heat with wood but, regardless, I am definitely getting rid of my ancient wood stove as it only gives me radiant heat. Currently I am looking into replacing it with a pellet stove which I like the idea of, but I will have some serious backup by next winter – probably electric baseboard heaters for just in case. Yes, I did get a divorce and I am very glad its over lol. It does feel absolutely wonderful to finally be free and to finally be able to really finish and fix my home! Oh my goodness, Tarah! You did an amazing job! I can’t imagine taking that task on, but you have absolutely rocked it! I’m so happy for you. Thank you for sharing and for being a part of the Hearth and Soul Community! Thank you so much April!! And thank goodness spring/summer has FINALLY arrived! 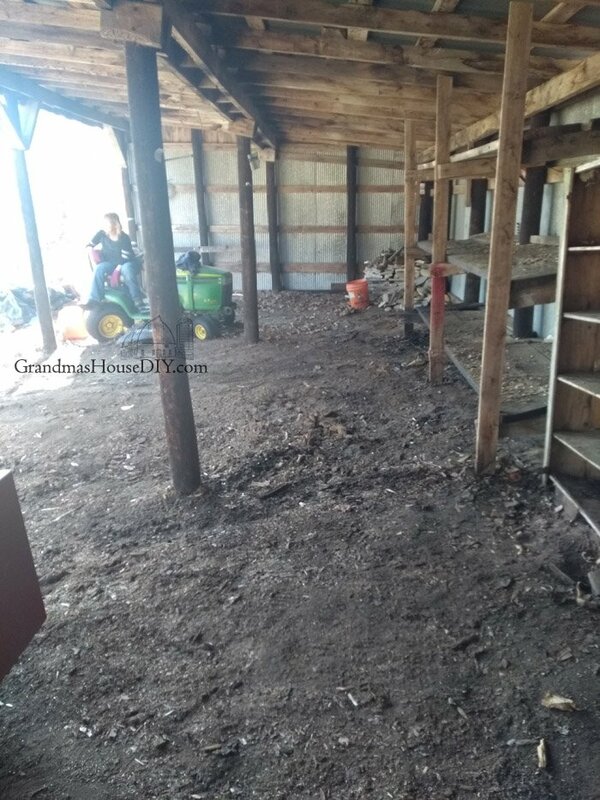 There is a lot of interest in your massive shed clean out, we are going to feature it on the next Blogger’s Pit Stop. A job well done. Hi Tarah: If you are considering electrical heating, you might want to think about off-peak heaters. The co-op sells the electricity at a reduced price because there is less demand for it at night, then you store it in bricks within the unit and use it as needed. An extra advantage is if the electricity goes out you still have a good supply of heat. I’ve had the electricity fail for five days and my home was still amply heated. Oh wow Tom, now that is definitely something I will keep in mind! Thank you!